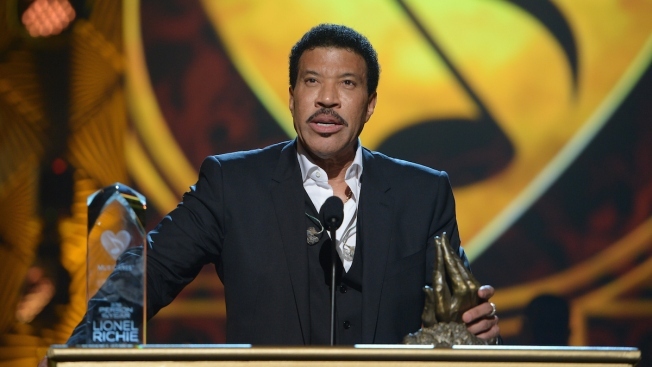 Honoree Lionel Richie accepts his award onstage during the 2016 MusiCares Person of the Year honoring Lionel Richie at the Los Angeles Convention Center on February 13, 2016 in Los Angeles, California. Rihanna, Usher, Stevie Wonder and John Legend paid tribute to Lionel Richie in a musical tribute touching on his roots in R&B to his string of romantic, easy-listening ballads that ruled the airwaves in the 1980s. They joined The Band Perry, Demi Lovato, Luke Bryan, Chris Stapleton and Ellie Goulding in launching Grammy weekend Saturday night by honoring Richie as the MusiCares Person of the Year. Richie was toasted for his musical achievements and philanthropic work two days before the Grammy Awards. The 66-year-old singer-songwriter launches a string of South American tour dates later this month. Rihanna, wearing red sneakers with her red and white floral gown, sang "Say You, Say Me" backed by a string section. Usher showed off his dance moves on the buoyant "Lady (You Bring Me Up)." "You really got the white people up and dancing," cracked host Jimmy Kimmel, who came out sporting a huge Afro and a white jumpsuit. After seeing old clips of Richie in sequined jumpsuits, Kimmel joked, "He has so many terrible outfits." Lenny Kravitz, Florence Welch and Dave Grohl provided the most unpredictable versions of Richie hits. Kravitz kicked off the 2 ½-hour show with a rock version of "Running With the Night" that included a guitar solo. Welch's take on "Dancing On the Ceiling" featured guitar-strumming and rhythmic hand-clapping from the idle string section. Grohl, lead singer of Foo Fighters, showed off a rare romantic side with a jaunty version of "You Are" that had the crowd on its feet dancing. He explained his connection to Richie came about last year after Grohl broke his leg on tour. Richie sent the rocker a huge basket of muffins as consolation, and Grohl saluted him as the "Muffin Man." Legend performed "Easy" on piano, and Wonder touched on Richie's early days with the Commodores by doing "Three Times a Lady." Yolanda Adams and a choir injected powerful gospel into the proceedings, earning one of the night's standing ovations. Pharrell and the Roots were joined by Little Big Town, Leon Bridges, Tori Kelly and Corrine Bailey Rae for a medley that culminated in the Commodores' classic "Brick House." Oscar-winning actor Kevin Spacey did a cappella snippet of "Mr. Bojangles" before introducing Richie, who gave a shout-out to his "fabulous" hometown of Tuskegee, Alabama, where he met the Commodores in college. Richie said that from his earliest hits he didn't realize how the music business worked, with R&B, pop and country in separate categories. "I did not know that there were categories until I walked into a station one day and they said, 'We can't play your record because it's too black,' " he said. "So I went home and wrote 'Easy' and I brought it back. They said, 'We can't play the record because it's too white.' I was confused." "The slogan in those days was, 'Lionel Richie crossed over and can't get black,' " he said, drawing laughter. "Today I am standing here celebrating all the songs they told me would ruin my career." In his acceptance speech, Richie poked fun at his reputation for crooning baby-making music. "I am the father of mankind," he said. "More men have come up to me and said, 'Lionel, I have made love to you many times.' "
Richie took to the piano to play and sing "Hello" before closing things out with "All Night Long (All Night)" as confetti blasted the stage. Among the crowd were producers Quincy Jones and David Foster, Motown founder Berry Gordy, David Crosby and Joe Walsh. Saturday's dinner and auction earned $7 million, the highest grossing evening in the tribute's 26-year history, Recording Academy President Neil Portnow said. "I cannot be more proud of all of you," Richie told the crowd at the Los Angeles Convention Center. MusiCares, run by the Recording Academy, provides financial assistance to individuals in the music industry during times of need.